The Odyssey is one of the classic stories of ancient Greece; penned by the Greek epic poet Homer, the Odyssey tells of the struggles of the Greek hero Odysseus in returning home after the fall of Troy. Written in the 8th Century BC, the Odyssey is often seen as a sequel to the Iliad, although there is gap in the timeline from the end of the Iliad, and the journey of Odysseus, a gap relating to the actual fall of Troy. The Odyssey begins in the Ithacan realm of King Odysseus ten years after the walls of Troy had fallen to the Achaean forces. In the absence of Odysseus, the palace and realm of the king are being run by Odysseus’ wife Penelope, and his 20 year old son, Telemachus. News of the Achaean victory had many years previously reached Ithaca, but the continued absence of Odysseus was a cause of concern, for the journey back from Troy should have been a matter of weeks not years. 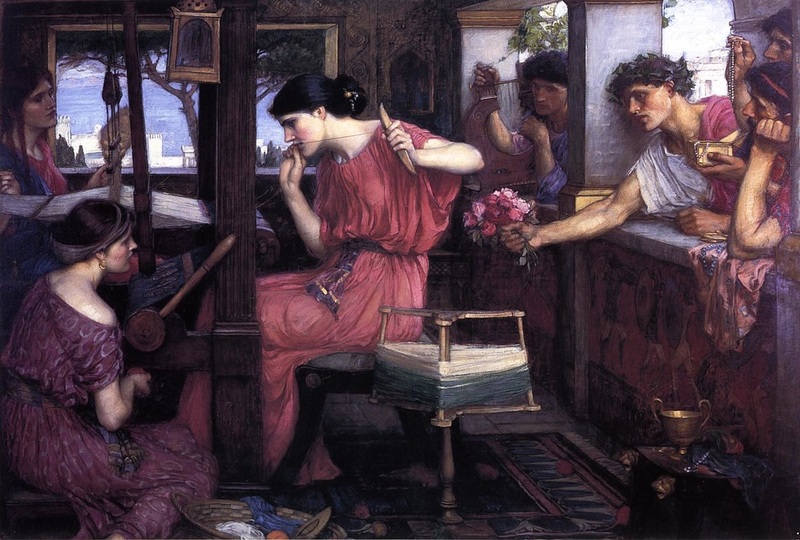 The absence of Odysseus had seen a growing number of suitors seek to marry Penelope and take over the Ithacan throne. Penelope had done her best to dissuade and delay the suitors, but now over 100 men were awaiting a decision. Penelope would also have to do without the help of her son in dealing with the suitors, for Telemachus had been tasked by the goddess Athena to find out the fate of his father. 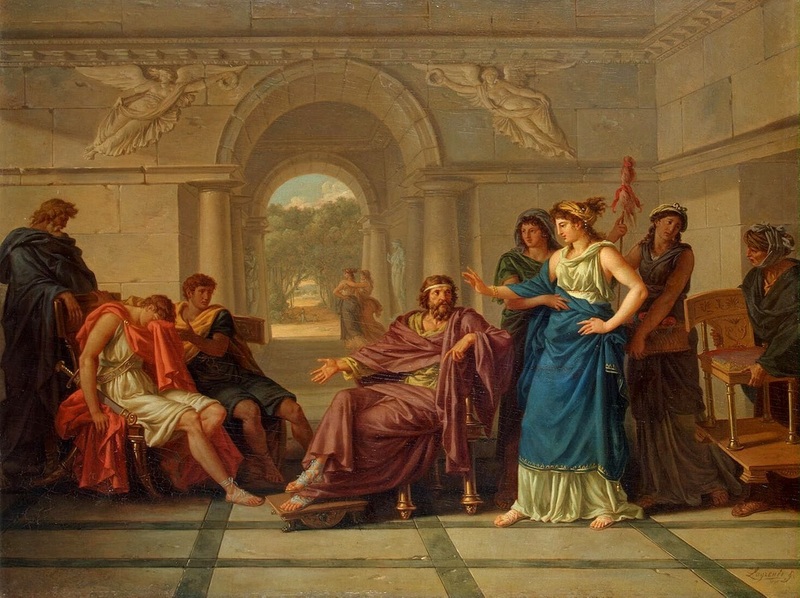 Telemachus travels to the court of Nestor, a Greek hero who had fought alongside his father, and then onwards to the Spartan court of Menelaus and Helen. In Sparta, Telemachus learns of his father’s captivity at the hands of Calypso, although he can do little with the news. By tasking Telemachus with his quest though, Athena has saved the son of Odysseus, for Antinous, one of Penelope’s suitors had sought to assassinate him. The tale told within the Odyssey then moves on the actual story of Odysseus. The fate of the Greek hero has been debated amongst the gods of Mount Olympus, and many feel that the period of seven years on the island of Calypso is enough punishment for any wrongs committed by Odysseus. 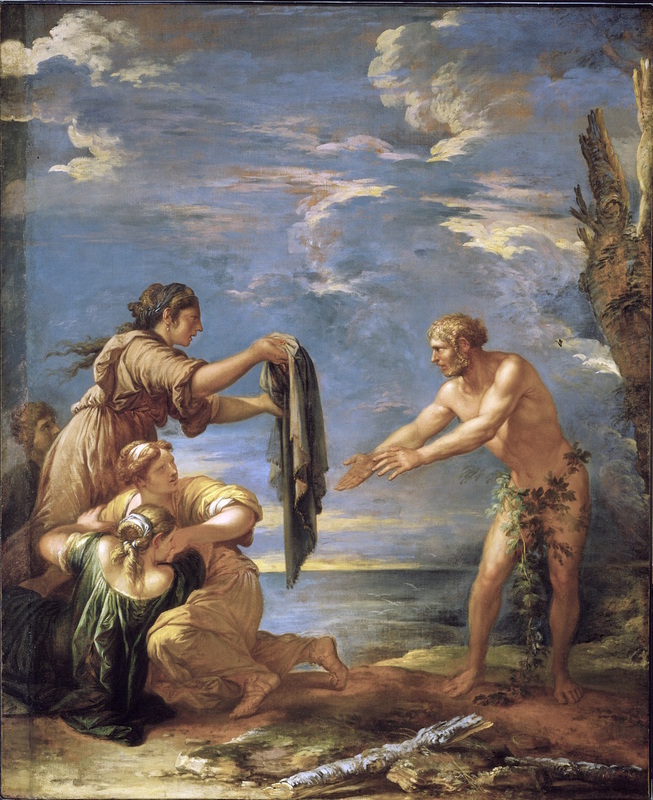 Hermes is therefore sent to Calypso, informing the goddess of the order to release Odysseus, although the goddess has fallen in love with her “captive”. 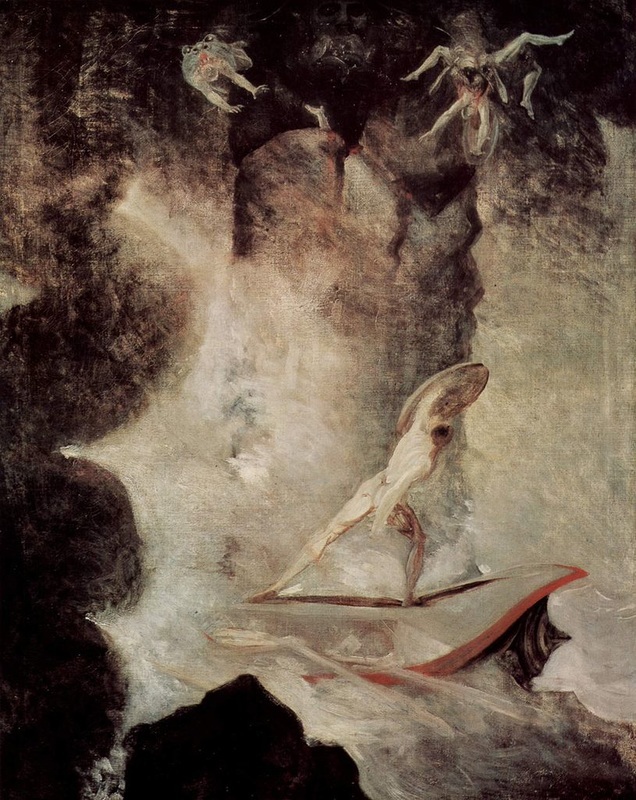 Nevertheless, Odysseus is free to return home, and so he sets sail upon a raft; unfortunately, not all of the gods were in favour of his release, and as he entered the domain of the sea god Poseidon, the god decided to wreck the raft in punishment for Odysseus’ treatment of Polyphemus, a son of the sea god. Odysseus survives, and manages to make his way to the island of Scherie, the home of the Phaeacians. Once upon land, Odysseus is helped by Nausicaa, who takes the hero to her father, King Alcinous. Odysseus has not yet revealed his true identity to the Phaeacians, but when he is regaled with stories of Troy, Odysseus tells of his own tale. Odysseus had departed from Troy with 12 ships, but a foul wind had quickly blown them off course, and had arrived, inadvertently, at the Land of the Lotus Eaters. Odysseus’ crew had then started to partake of the Lotus, and had promptly lost all desire to return home. Odysseus had had to force his crew back onboard the ships. Odysseus travels on with his sailors to the home of Polyphemus, the one-eyed Cyclops, and son of Poseidon. In order to escape from the cave of the Cyclops, Odysseus blinds the giant, but this action sees the sea god curse Odysseus. Even so the route home should have been assured as a gift from Aeolus provided the Greek hero with a bag of the winds. This bag was opened by Odysseus’ crew, and the release of all the winds at the same time forced the ships away from Ithaca. The struggle home began once again, and soon all of bar one ship was destroyed by the Laestrygonians. Odysseus survived to make it to domain of Circe. Odysseus was forced to stay with the witch goddess for a year, in order to rescue his men, many of whom had been turned into pigs. It was though Circe who provided Odysseus with the information which would eventually see the Greek hero descend into the underworld in order to visit the prophet Tiresias. It was in the underworld, amongst the spirits of Greek heroes and his own mother that Odysseus would learn of events on Ithaca. Finally it seemed that the journey of Odysseus was to come to an end; as his ship managed to sail past the Sirens, as well as Scylla and Charybdis. Once again, the actions of his crew upset the plans, as the cattle of Helios were hunted for food. Another god was angered, and all bar Odysseus were drowned when the Greek ship was wrecked, with only Odysseus saved as he found himself on the island of Calypso. The recount by Odysseus ends at this point, but King Alcinous, was so impressed that Odysseus was given passage to Ithaca, where the returning king was dropped at night in a secluded cove. Odysseus makes his way to the home of Eumaeus and trusted servant, although again Odysseus doesn’t reveal his identity. Telemachus himself arrives at the same point as his father, although he has had to avoid an assassination attempt. Father and son are reunited, and plans are made for Odysseus to take up his rightful place. Next morning Odysseus returns to him his home in the guise of a beggar, and witnesses the actions of the suitors. Odysseus also tests the loyalty of his wife, without her recognising him. Indeed only one member of the household, Eurycleia, recognises her master. Athena guides Penelope in her actions, and Penelope sets a test to decide who would finally take the place of Odysseus. It is a test of physical prowess, where the bow of Odysseus was to be strung, and an arrow to be shot through twelve ace heads. Of course only Odysseys can achieve the fete, and with weapon in hand, he sets about killing those who had taken over his home. Odysseus is aided by Telemachus, Athena, Eumaeus and another servant, Philoteus. A number of untrustworthy servants were killed, as were all of the suitors. Finally Odysseus convinces Penelope of his own identity, mainly due to his knowledge of their matrimonial bed. The Odyssey though is not quite finished. Odysseus has killed many of the most noble males in Ithaca, as well as having caused the deaths of all those who crewed his twelve ships. It would seem that the whole of Ithaca was set against their king, until the intervention of Zeus and Athena, brings forth a peaceful culmination to the epic poem. The Odyssey is a tale of one man’s struggle to return home, but whilst you might think it is a tale of strength, it is more about the cunning and intelligence of Odysseus in overcoming what might be considered impossible odds.